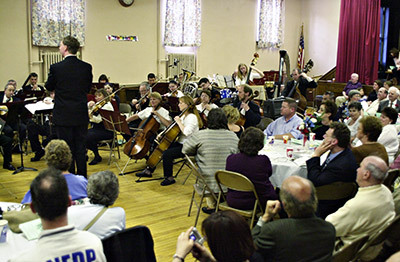 Constellation Masonic Lodge graciously hosted the Parkway Concert Orchestra on a beautiful Sunday afternoon. 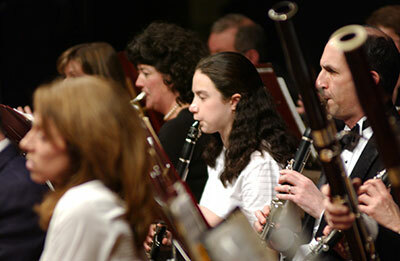 The concert drew an enthusiastic, near capacity audience in spite of the beautiful weather. 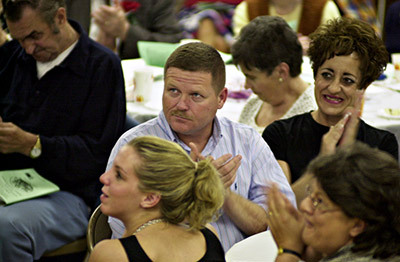 Previously, the Masonic organization’s thoughts were with one of their members, Mr. Rick Canan, who was serving in Iraq. 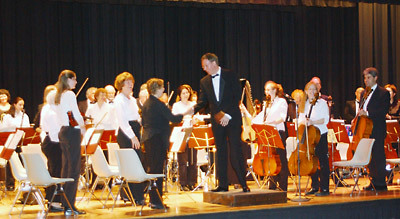 This concert had a special meaning as they celebrated Mr. Canan’s safe return to the States. 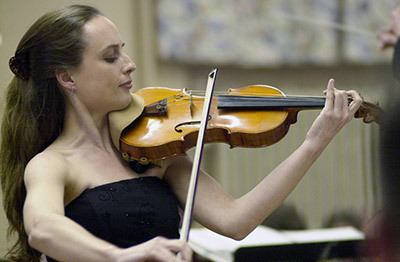 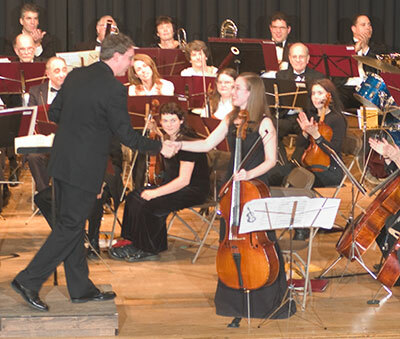 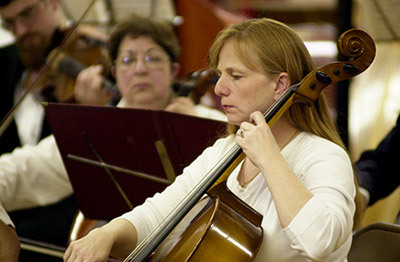 Violin soloist Katy Gillan performed with the orchestra in both portions of the concert. 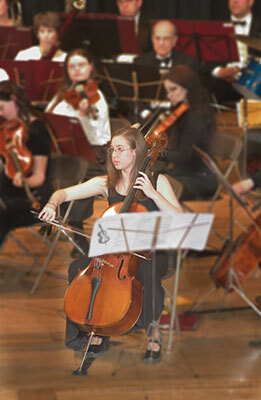 Here she is performing Beethoven’s Romanze for Violin and Orchestra. 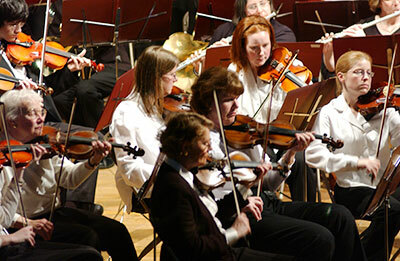 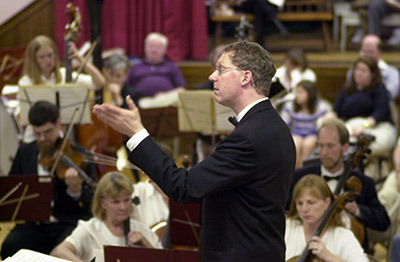 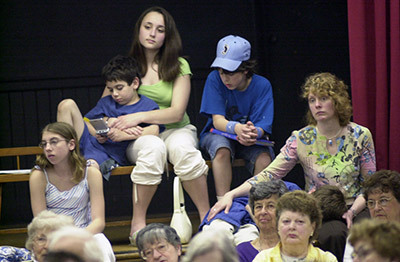 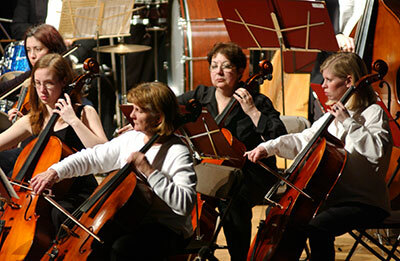 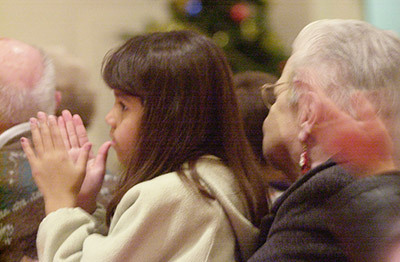 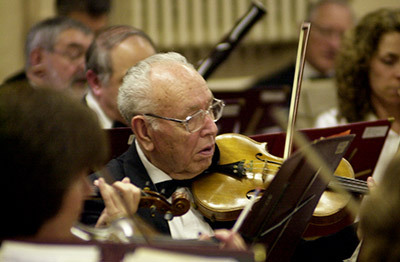 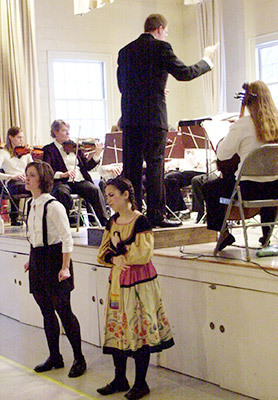 The Orchestra’s distinctive repertoire of classical and popular music kept an audience of all ages happily engaged. 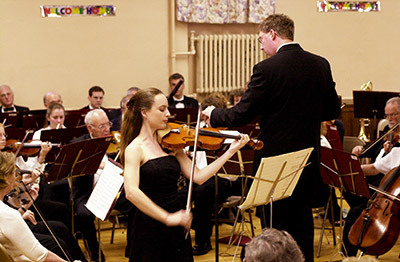 Violin soloist Katy Gillan joined the Orchestra again after intermission, performing the haunting Theme from Schindler’s List by John Williams. 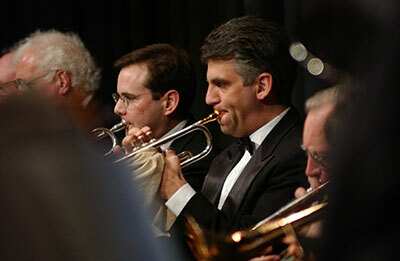 Neal Boornazian performs trumpet solo for Morton Gould’s Pavanne. 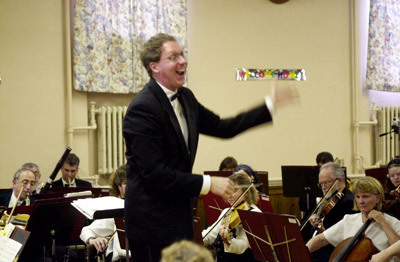 Mr. Canan enjoys the concert. 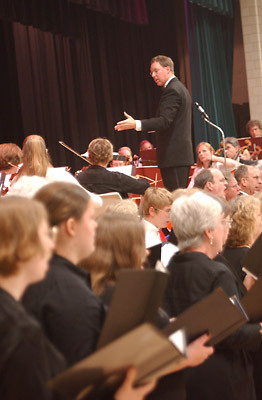 Mr. Isaacson cues the audience enthusiastically during the sing-along From Sea to Shining Sea. 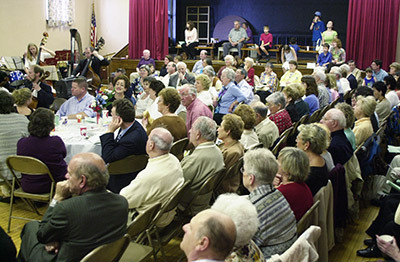 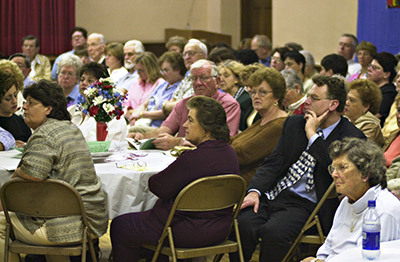 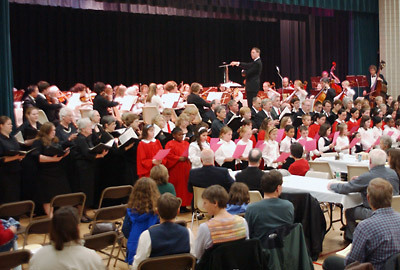 Milton FAME (Friends and Advocates of Music Education) partnered with Milton’s MRE (Milton Residences for the Elderly) to bring the Parkway Concert Orchesta to Milton for a Fund Raising Event to support the music program in the Milton Public Schools. 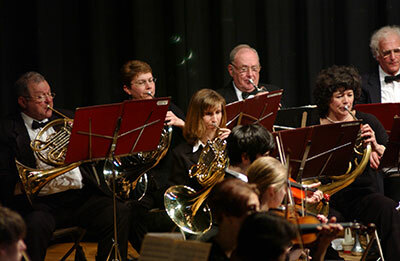 It’s always exciting when the PCO puts on a concert, but this was particularly so for Milton because not only did the concert feature Jenny Nelson (MHS senior, cello, member of PCO for 5 years) as soloist for the Saint Saëns “Allegro Appassionato”, but the entire MHS Strings program (20 students) joined the orchestra for Sibelius’ “Finlandia.” Here are some glimpses from that performance. 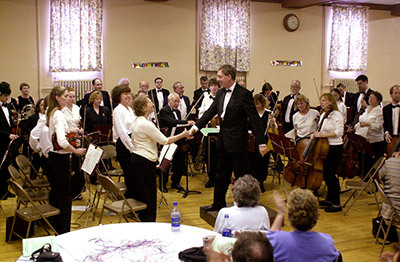 Two concerts in two days! 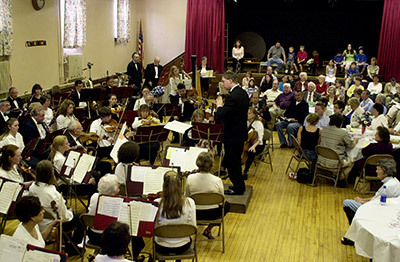 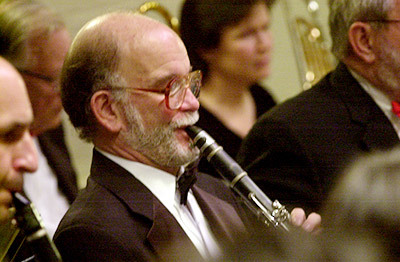 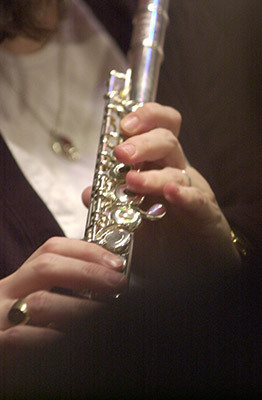 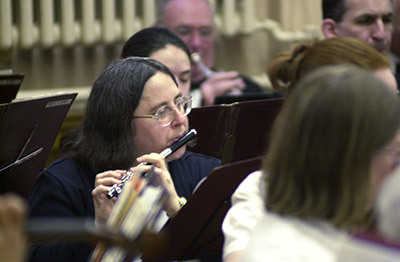 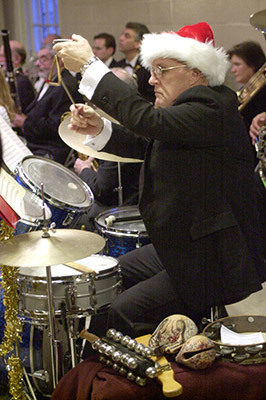 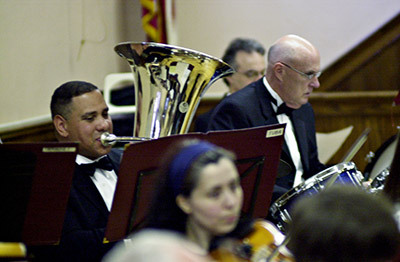 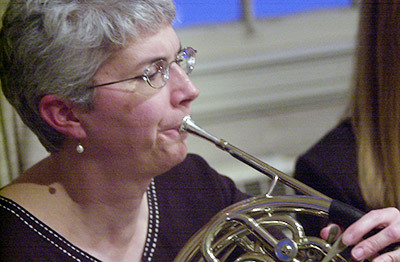 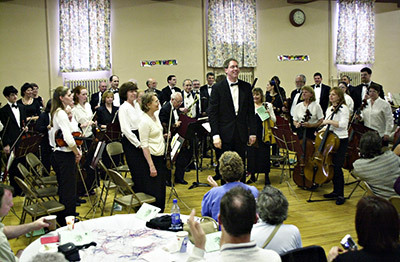 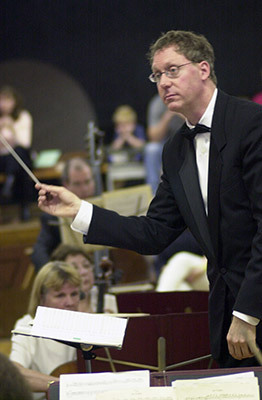 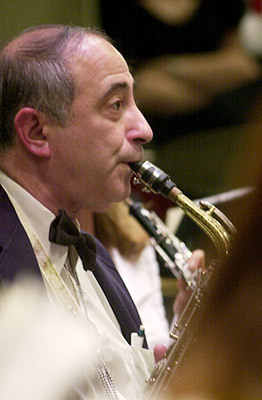 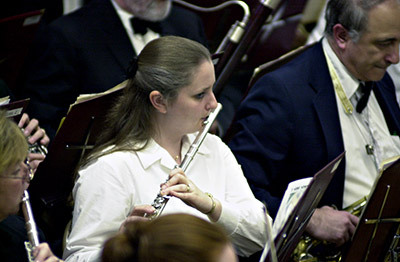 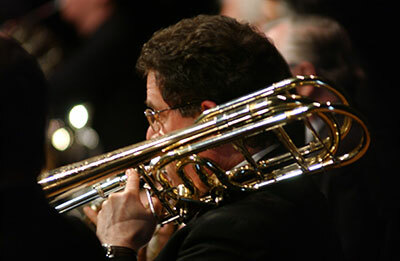 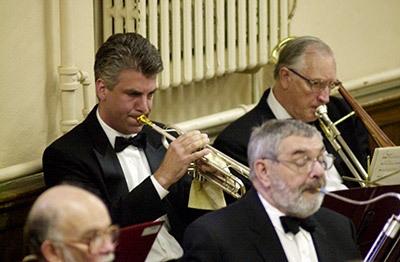 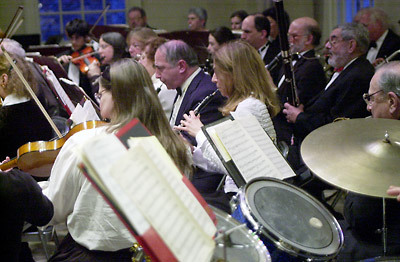 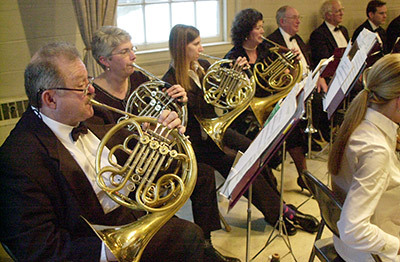 The Orchestra played on Saturday the 13th to make up for the previous weekend’s snow cancellation and then the regularly scheduled performance at the First Congregational Church in Norwood on the 14th. 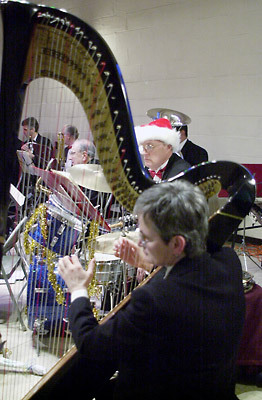 The sight of more snow falling softly added to the festive nature of the holiday performance. 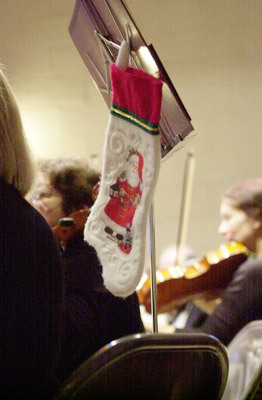 A stocking hung from a music stand seemed the perfect image for this Holiday Concert! 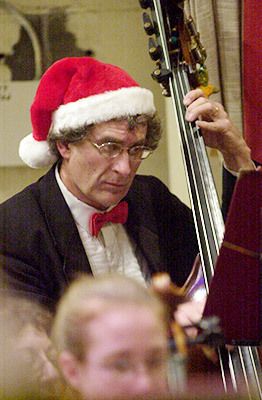 Not exactly elf–like perhaps, but Greg Mooter on bass and Tom Finn, percussion, added to the holiday cheer with their festive attire. 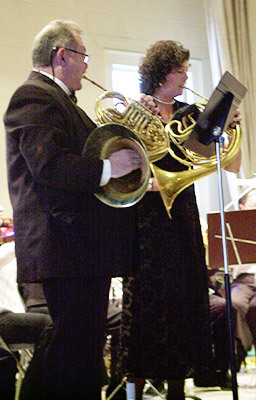 Adele van den Bosch and Mark Louttit treated us to another dazzling performance of the Vivaldi Concerto for Two Horns. 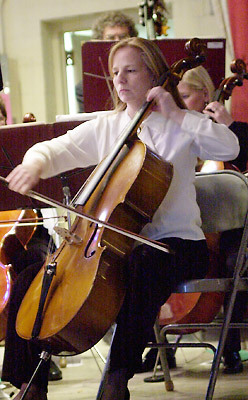 The lovely cello solo in the Largo movement was performed by Helen Tarantino. 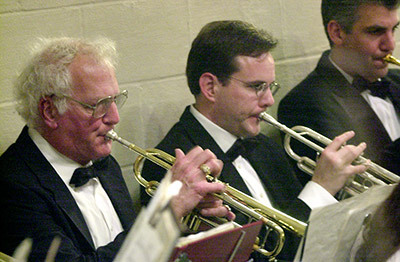 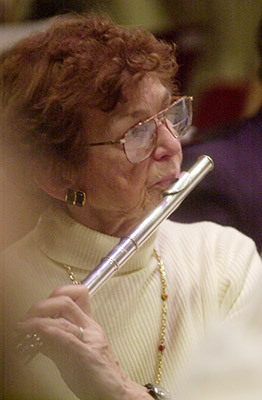 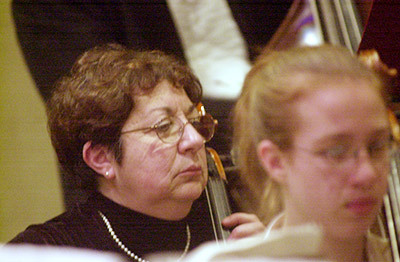 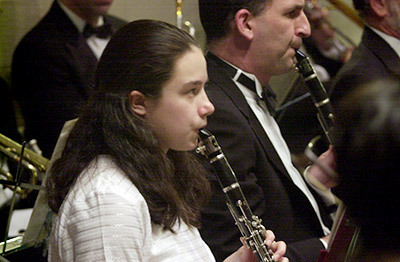 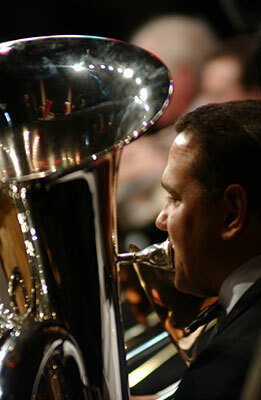 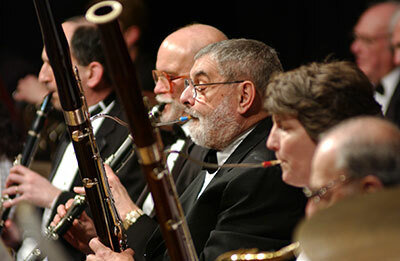 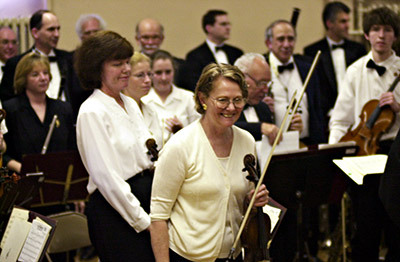 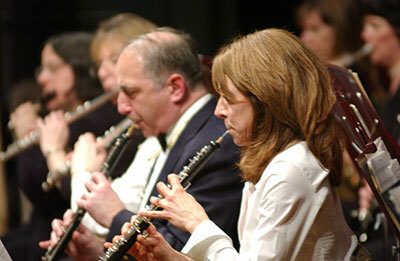 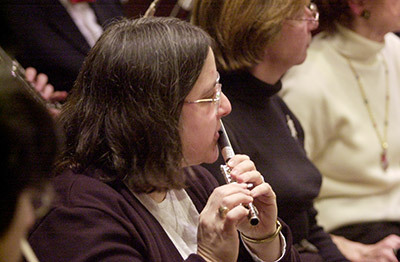 some candid glimpses of the musicians that make up the Parkway Concert Orchestra. 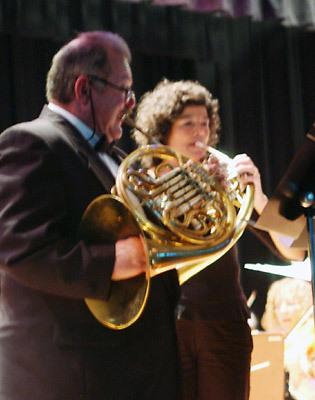 Mark Louttit and Adele van den Bosch perform Vivaldi’s Concerto for 2 Horns in F Major. 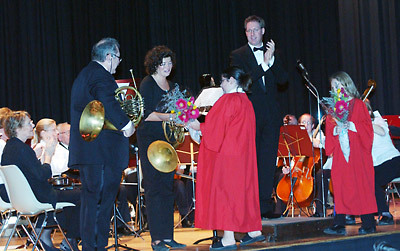 Horn solists presented with flowers at the end of their performance. 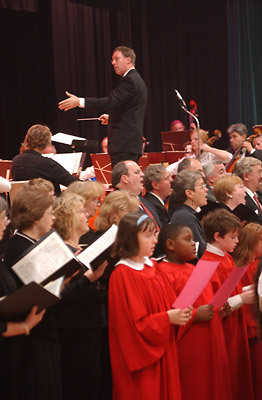 Three movements from Bach’s Christmas Oratorio featured the Orchestra together with the St. Theresa Parish Choir, Chorister’ Choir, High School Choir and the Choral Art Society (directed by Dr. Richard Bunbury).